I went to see the dentist and from the title of this article, you can guess what happened. Over five years ago, the dentist found four shallow cavities in my mouth using a probe called a DIAGNOdent. Eventually, I got two of them fixed, but as a full-time mom, I never seemed to have the time to fix the other two. Look at those beautiful pearly whites! Cavity-free! At my appointment, the first thing the dentist brought up was the two outstanding cavities. Using a photo, he pointed out the grooves on my molars and advised that I should get them filled. I told him I wanted to know the current DIAGNOdent readings for my teeth and while he was checking them, he asked the hygienist what the old measurements were. I asked him to clarify what he meant and what the current DIAGNOdent readings were. He said 17 and 12. Then, he told me they were changing the recommendation from drilling the teeth to simply monitoring them. He also told me to keep up the good hygiene. It was because I finally decided to heal my teeth. I mentally high-fived myself because I had objective proof—diagnostic measurements documented in my dental chart—that my teeth had remineralized themselves naturally. So how did I do it? More importantly, how can you do it too? Is it really possible to reverse tooth decay? 1) I decided to heal my cavities. Getting teeth drilled isn’t a big deal for me. I don’t get freaked out going to the dentist, so as a result, I had never felt compelled to do anything to heal my teeth because I always figured if they got worse, the dentist could fix them. However, something happened that compelled me to decide to heal my cavities (see point #3). 2) I ate Xylitol candies. I had come across a newspaper article on using Xylitol to prevent and reverse tooth decay while visiting family in Canada. My mother-in-law had picked up a paper on the airplane while on a layover in England. The only reason she had kept the paper was because the Sudoku puzzle was on the back. The reporter who wrote the article followed a Xylitol/mouthwash routine based on a book written by a dentist. The routine seemed overly complicated to me, so I bought some organic Xylitol candies and just ate them whenever I felt like it. Maybe about once a day after a meal. Sometimes I’d forget about them and not eat any for weeks. I certainly didn’t bother with the mouthwash routine or eating the candies after every meal as advised in the article. 3) I ate more dairy. I considered what was the most likely nutrient that I needed to heal my tooth enamel. A friend had shared an article on Facebook about how nutrition can impact your teeth. It made a lot of sense to me because when the cavities developed, it was at a time in my life when I was under a lot of stress and my digestion wasn’t that strong, so I cut out a lot of foods that were hard to digest (e.g. dairy, protein, sugar, alcohol, etc.). How I kicked my restrictive diet is a whole other story. Maybe a future article! The obvious answer to the missing nutrient question was calcium, so I simply started eating more dairy products. I’d eat an extra slice of cheese about once or twice a week. The article my friend shared received a lot of comments. Some people were supportive of the idea of naturally reversing tooth decay. Many others were absolutely livid because they felt that healing your teeth naturally was complete and total quackery. As someone who is fascinated by the body’s innate wisdom and infinite power to return to balance, I felt like it was my duty to give it a go and see whether it was possible to naturally reverse tooth decay. That’s when I decided to COMMIT to healing my teeth. Until I made that wholehearted choice, nothing I did would have made much difference. 4) I started massaging the Chinese reflexology points for my teeth. I didn’t practice that often. Maybe, about a minute twice a week for 3 to 4 weeks and after that, about once or twice a month. 5) I changed my thoughts and beliefs regarding my teeth. Instead of thinking I had cavities that would get worse over time, I started imagining my teeth rebuilding themselves. Sometimes, I’d place my palm on my cheek and imagine healing Qi (life force energy) from the Earth and the Universe flowing into my teeth and the grooves filling themselves. I ignored all the people who said it’s impossible to naturally reverse tooth decay. This didn’t mean I stuck my head in the sand and hoped the cavities would magically disappear. I still went for regular check-ups. Each visit, the dentist told me they were shallow cavities, so it wasn’t a priority for me to fix them. What I did do to reverse the tooth decay was to make a conscious choice about which belief would serve me more–to believe it was impossible to heal your teeth or to believe it was possible. I chose the latter. What Can You Do to Heal Your Teeth? So, the million dollar question is, “Can you follow the same steps I did to reverse their tooth decay?” Hold onto your seat for the answer. Before you’re discouraged, it’s important to understand why the answer is no. When you do, you potentially gain much more than just the knowledge to reverse tooth decay. You can awaken the power within yourself to heal your body from just about anything. Each person is unique. Each body is unique. 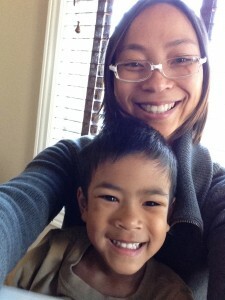 What you need to reverse tooth decay is different from what I need or what someone else needs. The reason why so many alternative therapies–and conventional treatments for that matter–work for some and not for others is because the emphasis is always on the modality of treatment and not the person. No one is an expert on any other person’s health. And when I say health, I’m talking about the totality of the person: mind, body and spirit. People can be experts on a disease, body part or system. They can be experts in treatment modalities, but no one is an expert on the sum of another person’s life other than that person! It’s not about following MY steps to heal cavities. It’s about listening to YOUR body’s wisdom to learn what YOU need to reverse tooth decay. Foods with cold properties cause Qi (life force energy) to descend. Thus, for someone with a weak constitution (e.g. poor digestion, chronically ill, tired all the time), Xylitol could mess up their Qi. This doesn’t mean that it’s a bad substance. It’s just something that needs to be consumed in moderation for the right body type. Ditto for the increase in my calcium intake. While I used my mind to make a shortlist of potential nutrients that would be beneficial, I listened to my body to know what I really needed. So, if you’re wondering if simply drinking more milk is going to make a difference, it’s not that simple. How did I know these things? It wasn’t accumulated knowledge. It was knowingness in every cell of my body. It is almost always beneficial even if you don’t believe in it. When you direct Qi to an area that needs to be healed, the healing energy helps your body to heal itself. 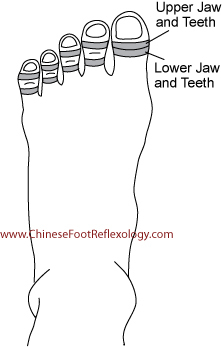 The Chinese Reflexology points for the teeth are located on the tops of the toes, below the toe knuckles. On the big toe, there’s just one knuckle, so the reflexology points are located above and below the joint. The reflexology area is shaped like a thin strip and there are two strips on each toe. The distal (top) strip is for the upper jaw and teeth. The proximal (bottom) strip is for the lower jaw and teeth. The toes on the right foot correspond to the left side of the mouth and the toes on the left foot correspond to the right side. Use your thumb to press and rub across the strip in a side-to-side motion. Massage the reflexology points for your teeth for about a minute every other day. Ideally, you should be massaging your kidney point too. In Traditional Chinese Medicine (TCM), Kidney Qi plays in important role in supporting strong bones and teeth. To learn more about the Kidney point, sign up to receive your free Chinese reflexology charts and you’ll also get complimentary lessons on Chinese Reflexology (lesson 3 is about the Kidneys). You can use your feet to gauge how well something you’re doing is working. When there are problems with your teeth and gums, these reflexology points are extremely sensitive to massage. As your body heals, the teeth points on your feet feel less sensitive. True healing isn’t about researching the right routine, eating the right foods, taking the right supplements, etc. It’s about listening to your body’s innate wisdom instead of the incessant ramblings of your brain. If you’re a super-analytical type, Chinese Reflexology gives you a tool to hear your body through your feet. Your mind answers with words. Your body answers with feelings. So ask questions like, “Would Xylitol be beneficial for me?” and listen by feeling. When I chose to commit to healing my cavities, that’s when the right information appeared to me almost serendipitously. That’s why I shared the story of how the Xylitol article crossed my path. What were the odds on all those unusual circumstances happening so that I picked up a UK gossip rag and read the article? As well, instead of going out and buying the book that the article talked up, I tuned in to my inner guidance. My brain told me it was logical to get the book, but my whole being FELT it was tedious, so I listened to that voice instead. The way I used my mind to support me was to believe in my body’s ability to heal and support it by replacing negative thoughts such as, “I hope this cavity isn’t getting worse.” with positive thoughts such as, “I love you, teeth. You are healing.” Mostly, I imagined myself in a state where I felt this, rather than simply repeating words to myself. When you reach this state of being, you can heal yourself of anything, regardless of what anyone else believes. So, why limit yourself to just your teeth? Over the course of future articles, classes and programs, I’m going to share much more on how to become a person with the ability to self-heal. It’s not a 30-day thing where you flip on a switch. It’s a journey of personal growth and expansion. I’ve walked this path myself and went from being really sick and unhealthy to “average person” healthy, but it’s what I’ve discovered in the past two years that have enabled me to experience amazing health, radiant vitality and BE that person who can easily heal her body. That’s what I get excited about teaching and sharing. Decide whether or not you want to be a person who can heal their body. It might seem like a no-brainer choice on the surface, but your subconscious mind knows the real deal and it’s what will throw up resistance. When you have the power to heal yourself, you take on a great responsibility. You take complete ownership for your health and wellbeing. You can’t slough it off on a doctor or depend on your fave healing practitioner to fix you up. You realize that they are merely facilitators and the real healing is up to you. When you know how to heal your body, you know how to prevent disease, accidents and illness. This means that you can’t live in ignorance any longer. You can’t pretend that eating junk food or sitting at your desk for 4 hours straight is okay. You realize that every time you stay up too late or hold a grudge against someone, you’re ignoring your body and harming your physical wellbeing. This knowledge and awareness is a big responsibility. On the flip side, taking on this responsibility means you have reclaimed your power. You hear your body and your body responds joyfully. You have radiant energy and you feel empowered. You’re almost always in a state of balance and joy. And if you do find yourself getting a little bit off-balance, you can easily bring yourself back into harmony and a state of health and vitality. Do you consciously choose to become someone who can heal their body? If the answer is yes, keep reading my blog, sign up for my newsletter, join my Facebook page or choose to learn more through my programs and classes. They are all designed to help you become empowered, energized, radiant and full of health and vitality. It’s who I am. And it’s something you can be too.